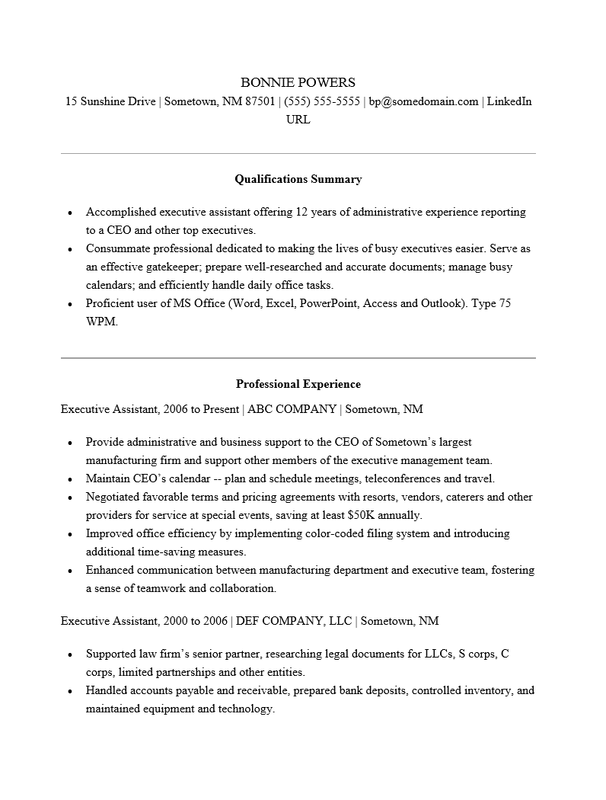 The Executive Administrative Assistant Resume Template focuses on presenting a large amount of information in a stylish format that is attractive and easy to read. Executive Administrative Assistants must display the impressive amount of knowledge and skills necessary to provide a high level of support to executive level administrators, board members, and company owners. Therefore, a typical Executive Administrative Resume must display clearly written content regarding professional history which would support a candidate’s proficiency in technology, communication, office support, as well as their educational credentials. In addition to presenting information, the Executive Administrative Assistant Resume often provides the interviewer with a structure for the interview by providing topics of conversation. Candidates should make sure they provide a wealth of accurate and above par content. However, it is important to find a balance between content and format as too much information can look quite bulky if one is not careful or may create time consuming format issues. Such obstacles may be easily avoided if employing the use of a template. 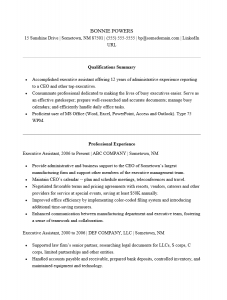 Job hunters should clear out a reasonable amount of time and gather their records when filling out the sections of the Executive Administrative Assistant Resume Template to achieve the best results. Step 1. Enter your name, title, address, phone/cell number, email, and social media details on the top center area of the page. Step 2. In the Qualifications Summary section, enter a list of your strengths, abilities, and accomplishments. Step 3. Organize your records, then enter specifics regarding your employment history in the Professional Experience section. Step 4. Enter your academic credentials in the Education and Training section.